To make the marinade, combine the pineapple juice, balsamic vinegar, brown sugar, garlic, peppers, allspice, salt, and pepper in a small cast-iron sauce pot on your side burner, and boil 2 minutes. Add the ice and set aside until cool. Cut the wings into 3 pieces each and discard the small wing tip (or save for soup). 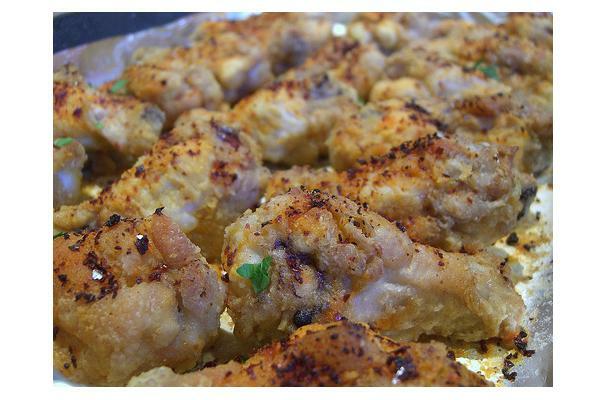 Place the chicken wings and the marinade in a bowl and refrigerate a minimum of 2 hours (or overnight). Remove the wings from the marinade and cook slowly on the grill for 15 to 20 minutes, turning occasionally. This recipe yields 24 pieces. Comments: This version is sweet and hot. Scotch bonnets are small peppers, but don't let their size fool you. They're one of the hottest peppers around.